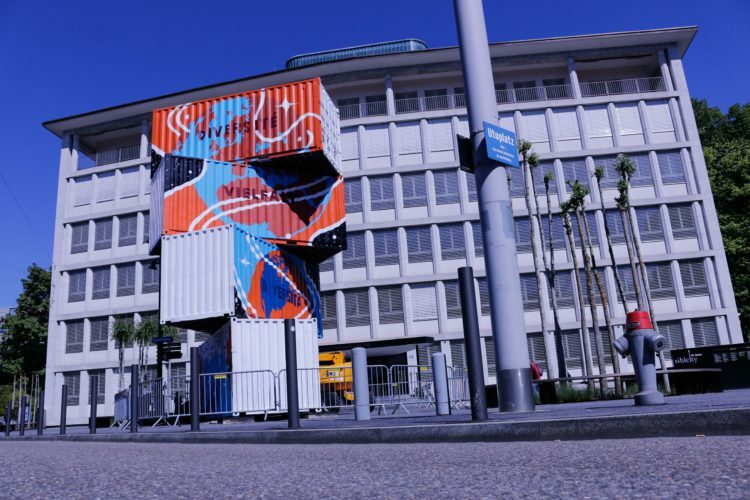 The 10.5 meter (35 feet) high tower, consisting of four 20ft containers, was the highlight of the Street Art & Music Festival of the Sihlcity Urban Entertainment Center in Zurich. The containers were statically secured with the help of 28 water tanks, each weighing one metric ton, rotated 42 degrees and stacked. Afterwards, the international artist duo Dourone and Elodieloll had a free hand spraying and painting the tower. The art project was conceived together with Karlin AG (CH) on the occasion of the 10th anniversary of the shopping center. This widely visible container tower is now available for your promotional or cultural event. It can be individually redesigned according to your wishes or, after agreeing with the artist on the usage rights, exhibited as street art work.